Our KES Prep Girls took on Tilton School Rams Varsity Girls Basketball in an exciting battle on Saturday, January 12. The game opened up with the team trading baskets and no team getting out to more than a 4-point lead without the other reeling them back in to tie it or take the lead. Our KES girls missed a few defensive assignments early, but crashed the boards and established their best rebounding game of the year. The girls were able to turn those rebounds into points off fast breaks and excellent offensive sets. Aaliyah Arab-Smith led the way in the first half with 10 points and several key passes for assists, while Claire Englehutt continued her inspired play on this trip, chipping in 6 points in the first half along with 6 rebounds. Halftime arrived with the teams separated by only 3 points, Tilton holding a 28-25 lead. Overtime saw the KES crew in foul trouble, and Tilton able to create a bit of separation on the scoreboard, and end up with a 68 - 59 win. The KES team has had 2 OT games go against them this year, and are looking to break through at the next Overtime opportunity. This game was our first loss in NEPSAC play, but the team has established itself as an upper-tier team in its class. Tilton's Coach Tara Brisson and I have already agreed to a "same time, same day, same place" for next year's game and beyond. Coach Brisson was very complimentary stating "your team belongs in this tough league, and I am going to be your biggest advocate for whatever your team needs here in New England. Those girls are really, really good..."
After a busy weekend that included a visit to Harvard University to see the Crimson Women’s Basketball Program in action, and a tour of the athletic facilities, our KES Prep team has this upcoming weekend off and are preparing for their 1st Annual family trip during the January Break. We look forward to having some of our player’s parents, grandparents and supporters along with us for a great weekend of NEPSAC games. 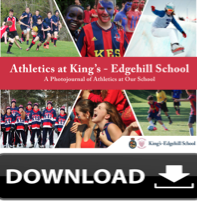 King's-Edgehill School Coaches are passionate about athletics and fitness. Your child can participate in a sport recreationally or competitively including soccer, swimming, equestrian, basketball with many, many more options to choose from. Download our Athletics PhotoJournal.